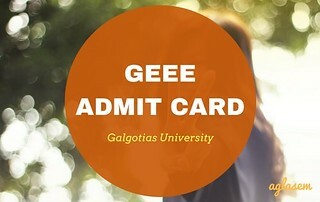 Galgotias University has released admit card of GEEE 2018 at geee.in. The GEEE 2018 admit card is available for download from June 12, 2018. 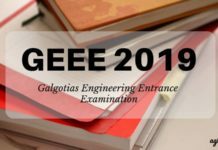 Candidates who have applied for Galgotias Engineering Entrance Exam by its deadline can get their GEEE admit card. Login to download admit card / hall ticket of GEEE 2018 as per schedule. Print it and bring it to exam hall on day of exam. It contains important details such as roll number and exam center address. Galgotias University has issued admit card in online mode only. Candidates who have applied for the entrance exam must visit the website and download admit card before exam. Candiates must keep application number safely as it will be required to log in to get admit card. Candidates need to login using their user id and password. 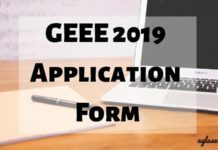 All the details printed on GEEE 2018 admit card are important. Such as the exam centre and timings convey where and when to appear for exam. It is mandatory to bring the officially issued admit card of GEEE 2018 to exam centre. Invigilators will also ask candidates to show it during exam. After the exam is over, candidates must preserve it as it will be required during counselling. Also read do’s and don’ts for the exam here. Note roll number as it will also be required to check result of GEEE 2018. The paper will be composed of three sections Physics, Chemistry and Mathematics, each section carrying 30 marks and there won’t be any negative marking. Question Paper will be of OBJECTIVE TYPE with Multiple Choice and in English language only. You will be provided 1 hour 30 minutes to complete the exam. How to download GEEE 2018 Admit card? You are required to enter your user id and password. Next, hit the login tab to generate your GEEE 2018 Admit card to appear for the entrance exam. Now, it is necessary to take the printout of admit card and keep it safely for future events. Do not forget to bring the admit card to the examination centre. Are you facing problem while downloading the GEEE Admit card? Sometimes, there might be connection problems while logging in therefore you should refresh the admit card page once and then re-enter the login details.